Since its 1986 debut in New Zealand, the Mac boats brand has become something of a kiwi icon. The range has a great reputation as tough, durable and safe boats, and the designs extend from 2.1m dinghies to the flagship 6m sports cabin boat. Constructed of rotationally-moulded polyethylene, these boats are light and require no maintenance. The plastic’s pre-coloured, so no painting is needed. With a claimed impact resistance five times that of fibreglass, the boats are almost indestructible. They are UV-resistant and impervious to osmosis and corrosion, and the plastic is recyclable. The thermoplastic properties makes the boats easy to repair in the unlikely event of damage. Mac is largely considered a manufacturer of powered or rowable boats – the new 370 is the company’s first foray into a sailing boat. A centreboard casing and mast step is built into the mould. Galloway International, the owner of the Mac brand, approached Stuart Innes to design and supply a simple and easy-to-sail rig for the boat. Innes has considerable experience in designing and modifying sail rigs for various yachting organisation, and this boat shows the benefits of that experience. The 370 is styled as a clinker-built dinghy. The side and stern seats are fully sealed pontoons filled with foam, providing masses of reserve bouyancy – the boat unsinkable. There is an amidships thwart and two rowlock mounts are set into the gunwale. These enable the boat to retain its heritage as a rowing dingy. Weighing just 120kg, the hull is light and easy to row. There is sufficient seating for at least four adults, plus room for some gear. A bow locker with a large hatch-cover holds the anchor, warp and safety gear, but could equally be used for stowage of other items. Since the boat looks like a small version of the classic Sea Scout cutter, I asked two members of the Orakei Sea Scouts to come along for the on-the-water test. We started by having them row the boat using the oars supplied. They had no difficulty – one junior oarsman easily moved the boat along at a reasonable pace. Next we converted the boat to its powered configuration. The transom’s protected with a section of aluminium plate to prevent the gouging that’s inevitable from an outboard motor. We fitted a 4hp Yamaha which proved more than adequate for this size boat. The hull is rated at up to 10hp and the boat would easily be planing with that sort of power. While under power the boat was easy to steer and handled well. At speed some water came up through the centreboard casing, a problem Innes says will be solved by a sealed cover (in the final stages of development). The test crew was encouraged to ‘throw the boat around’ – and were unable to ship any water. Next, we installed the sailing rig. The transom has two pre-drilled holes with threaded brass inserts which take the rudder pintles. The rudder mechanism drops onto these and a short cord allows the rudder to be lifted or lowered from within the boat. Innes has gone for a very simple sail configuration, and it’s easy to assemble. The unstayed mast is a two-part section of anodised aluminium, just under 5m in length. When in two pieces, it easily fits inside most family cars. The boom is the same length as the shorter of the two mast sections, and slots into a simple gooseneck on the mast. It’s a mainsail only rig. The loose-footed sail’s a sleeved design (stiffened by three battens) and hoisted by halyard. The halyard enables the boat to be fully rigged without the hassles of a flapping sail, a common problem with a sleeved configuration. The sail is and secured to the end of the boom by a simple cord should be easy and cheap. The boat can be prepared for sailing in about 15 minutes, and even a junior sailor would have no problem stepping the mast. The boat’s easily sailed by one person, although an extra crew allows for better weight distribution. As soon as Innes had shown our scouts the ropes, so to speak, he handed over the helm. She’s very stable. The centreboard is easy to operate, despite being longer than one would expect. Innes says the length’s essential for generating leverage for righting a capsized boat. The boat’s was supplied on a multi-purpose trailer that can also be used as a standard utility trailer. Thanks to the toughness of the polyethelene, if the trailer is needed for other duties the boat can be simply dumped on the garage floor without fear of damage. Our junior sailors were enthusiastic about the boat. They found it easy to sail, a pleasure to rig and the absence of any maintenance is a definite plus. These boats should find a ready market for families wanting an easy-to-handle sailing dingy that can also serve under power or oars. Similarly, youth organisations wanting an economical yet robust vessel should have a serious look at the Mac 370. For more details contact Tony Trueman on 0800 MACBOATS (62 22 62) or see www.macboats.com for dealer list. Walker Bay is a USA-based manufacturer of injection-moulded plastic boats that have been available in New Zealand for some time. The name has had a low profile locally until Smart Marine took over the marketing. Since then sales of the unique combination of inflatable collar and rigid hull dinghies have grown steadily. The hulls are constructed of a proprietary mix of UV-resistant plastic resins that are injected at high pressure into the largest injection-moulding machine in the world. The resulting boat is a perfect, one-piece hull with no seams and a high strength-to-weight ratio. What makes the boats more unique is the addition of an inflatable tube around the hull. Under light load and normal conditions this rides clear of the water and serves merely to keep spray down. When the boat is heavily laden the tube provides additional buoyancy, enabling a much greater carrying capacity than would be expected for the boat’s size. The greatest benefit of the inflatable collar comes when sailing. The hull heels over until the collar is resting on the water. It then acts as a restraint, preventing further heeling. This makes the boat a great vessel for inexperienced sailors or those who get nervous as the gunwale approaches the water. In the unlikely event of a capsize, the righted boat will hold less water and also be instantly stable. Conventional hulls are notoriously unstable when full of water and are difficult to bail out. We tested the sailing version of the Walker Bay 8 (which is, confusingly, 9ft or 2.75m in overall length. The ‘8’ refers to the plastic hull without the inflatable tubes). A 10ft (3.10m) version is also available. The boat is sold in components, enabling the buyer to mix and match the components as required. This also means the boat can be upgraded as skills and needs change, and a higher performance sail is also available. Our test day took place on a sunny, breezy Auckland day, with a slight chop on the water. The boat is small enough to fit on a roof rack on in the back of a wagon, so a trailer is not usually required. The unstayed mast collapses into short sections and the whole rig fits into a car boot. We inflated the tubes and assembled the rig in a matter of minutes, with the sleeved sail slipping over the mast. The boom angles upwards and provides ample headroom, so the crew need doesn’t have to worry about being hit by the boom when going about. The loose-footed sail attaches to the boom at two points. Everything about the rig is simple yet well thought out. The centreboard, constructed of a fibre-reinforced composite for strength, is surprisingly small yet proved adequate. The rudder assembly clips easily into its bracket on the transom, which is strengthened to accommodate a small, outboard motor. The boat sails easily and surprisingly quickly, given the modestly-sized, single unbattened sail. Our sailor tested the boat’s stability by sailing while standing up for a while, and the boat displayed no problems. The hull heels over as far as the tubes and then stays there, with no tendency to lift out the water. Beam-reaching produced far less sideways slip than the tiny daggerboard would suggest. On the downwind run the boat moved along at a good pace. The tiller has a retractable telescoping extension that allows the skipper to balance the weight in the boat to best effect while still maintaining full control. A clear acetate window in the sail also ensures visibility in all directions. The boat is easily sailed by one person, but could accommodate two adults with ease. Seating is in the stern seat, an amidships thwart or on the gunwales. At the end of the day’s sailing the boat is easily disassembled and packed away in a matter of minutes. Since everything is either plastic, anodised aluminium or composite, this boat requires very little care apart from the occasional wash. The boat does not have a drain plug, but given the size it’s easily tipped over to empty out any water. The basic hull weighs just 40 kg (including the tubes), and is easily carried by one or two people. It can also be safely carried on a car top or stored in the rafters of the garage. 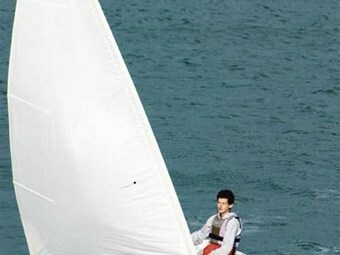 A carry bag contains the full disassembled sail rig, which can be stowed in the boat when not in use.